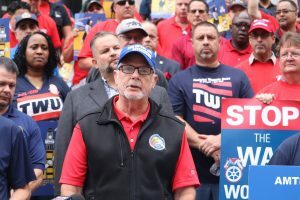 Workers and leaders from the Amtrak Service Workers Council (ASWC) rallied across from New York’s Penn Station in support of continuing Amtrak’s on-board food service and the 1,700 service staff. 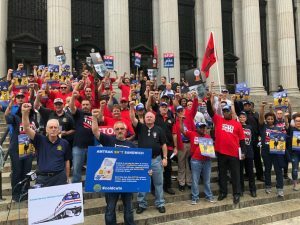 More than 100 Amtrak workers, union leaders and supporters vowed Tuesday to fight Amtrak CEO’ Richard Anderson “tooth and nail” to stop massive layoffs and service cuts. TCU/IAM Nat. 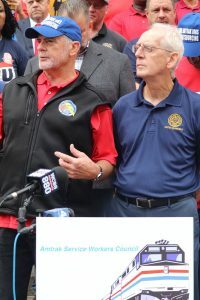 Vice President Jack Dinsdale (left) and TWU Rail Division Director John Feltz (right) answering questions from the press. TCU Nat. Vice President Jack Dinsdale speaking about the importance of these jobs and the high quality service they provide.